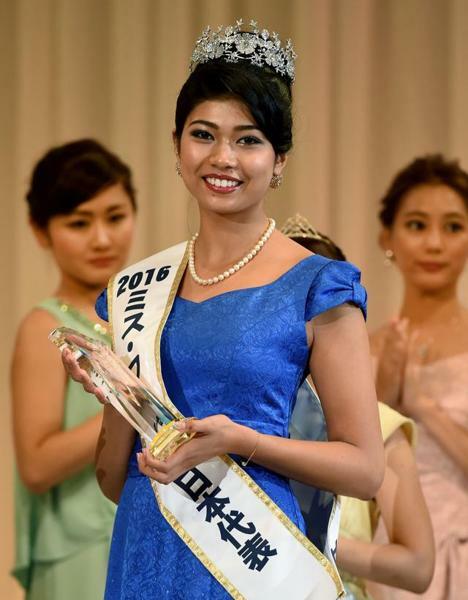 Priyanka Yoshikawa, 22 has been crowned Miss Japan and will be representing the country at this year’s Miss World contest. The half-Indian half-Japanese Yoshikawa who also has an elephant training licence, is the second biracial contestant in a row that has won Japan’s major international pageant. The first was Ariana Miyamoto, a half-African American who was crowned Miss Universe Japan last year. After Miyamoto was crowned, she faced backlash and criticism from social media for being the first black woman to represent Japan. Many argued that the representative of Japan’s beauty pageant should have been a pure Japanese and not “haafu” – the Japanese word of “half” which is used to describe a biracial person. Pop singer Angela Aki is half Italian-American. Though Yoshikawa didn’t receive as much criticism as Miyamoto, she mentioned that Miyamoto was the one who inspired her and encouraged her to join the pageant. “Before Ariana, haafu girls couldn’t represent Japan,” said Yoshikawa as quoted by AFP. “That’s what I thought too. I didn’t doubt it or challenge it until this day. Ariana encouraged me a lot by showing me and showing all mixed girls the way,” she continued. Yoshikawa aims to fight against racial prejudice in Japan, where multiracial children make up just 2 percent of those born annually, and to change the people’s perceptions. Some other notable Japanese haafu is pop singer-songwriter Angela Aki, idol and actor Eiji Wentz, former AV idol Maria Ozawa, John Lennon’s son Sean Lennon, footballer Sakai Gotoku and more. This article interested me very much. You described it great.